You must make reservations at least 5 minutes in advance of the time at Azure - The Royal Hawaiian. This beautifully redesigned island seafood restaurant features locally caught fish fresh from the auction using high heat aromatic herb roasting or prepared with authentic local tropical flavors. 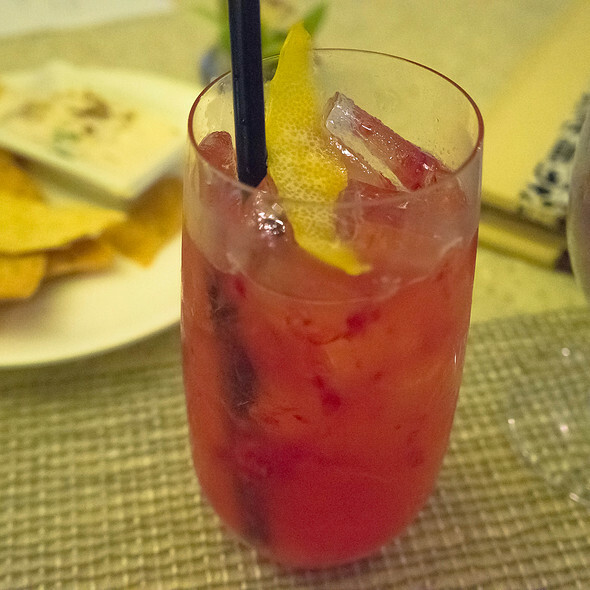 A carefully chosen wine list accents the delicate seafood flavors. Open only in the evenings the venue spills out towards the Pacific with views of the water from nearly every vantage point. Raising the Bar at Azure is a monthly event that transforms the typical wine dinner into an exciting, engaging beverage experience. Every month we'll feature new, provocative beverages from around the world with colorful commentary by industry experts and The Royal Hawaiian's Sommeliers Micah Suderman and Ariana Tsuchiya. 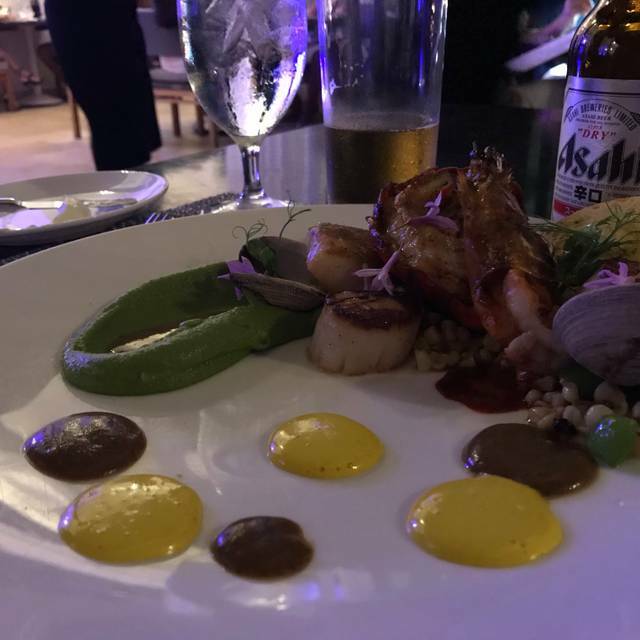 Creative small plates's by Chef Shingo Katsura and live music round out a fantastic evening. Join us every third Friday from 8 pm to 9:30 pm. $50 Per Person. $45 Per Person for groups of 4 or more. RESERVATIONS: (808) 931-7837 Leave a message for your reservation and we will call you back. Beautiful outdoor location! Menu overly complicated, food nothing special, very expensive entrees were $40-55 each. Mediocre service. As always one of the best in Waikiki!! As always, our dinner at Azure was wonderful! Quite simply my appetiser the sashimi was average and most damning for a restaurant that claims to focus on seafood my partner’s fish was badly over cooked as were the rubbery shrimp that accompanied it. And by badly over cooked I mean inedible. Food was tasty, service attentive and ambiance excellent. A good location for a casual dinner where the subdued noise level allowed a conversation to take place. We will be back when back in town. This was one of the best meals we’ve had this year. The beet salad was so fresh and complex, the surf and turf was so good I was steeling it off of my husbands plate. My scallops were cooked to perfection. We watched the sun set and had a view of Waikiki beach and Diamond head mountain. Our service was impeccable, we even splurged on the lemon cheesecake for dessert because we had been so impressed with everything else. Highly recommend, we cannot wait to go back. I cannot recommend based on this server. I'm sure other servers may do a better job. The hostess was very friendly and accommodating...I thought it was going to be another great experience when our server came and introduced himself and greeted us "Happy Anniversary!". This was for our 33rd anniversary. We'd been there a few years back for another anniversary and had a great experience then. But, this time was not the same. A glass of sparkling rose` took 15 to 20 minutes. We ordered sashimi for an appetizer and for our main the whole fish that is made for 2-3 people. Again it took a long while to get our 1st course. When came it was a salad instead of the sashimi. They took it back and after another wait brought our sashimi. When our main entree came and it was delicious and enough to share! But, when we were done they came to take our leftovers to pack and didn't clean the table. It was not what we were used to for a finer dining experience...they/He didn't refill our waters but was refilling water for a large group that was in front of us...He did not say we were getting a complimentary dessert and ended up ordering too much dessert. Even through serving dessert no one bothered to clean the table. We were very disappointed because by then most of the tables were empty and there was no reason to leave us unattended. 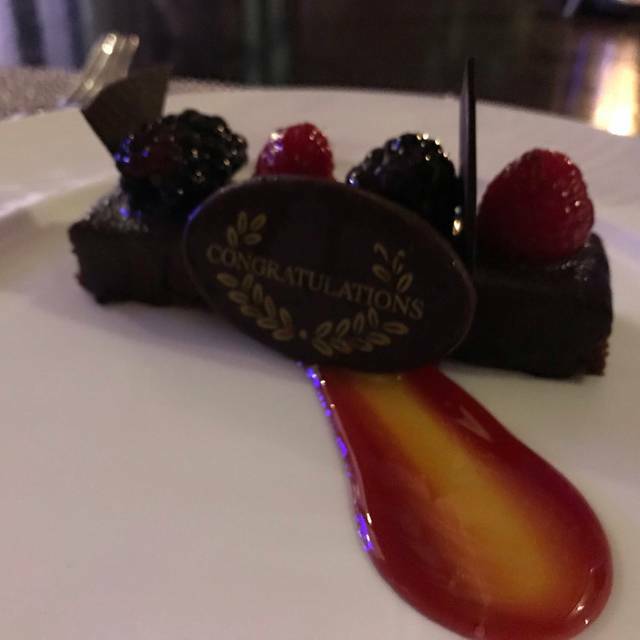 I would have said "YES" that I would recommended the restaurant based on our previous experience but, would not feel right if someone else had the same experience from this anniversary. This is a special occasion restaurant and it was. We dined early enough to enjoy people watching the last of the bathers and had a spectacular view of the Diamond Head Crater. We opted for the tasting menu with matching wines and they had no problems doing a change from red to white wine for me, always a good sign. The food was delightful, fresh and inventive and I could have eaten those mashed potatoes till I burst. The serves were well paced- I was full in the end but did not feel I was forcing food down. Sure it is pricey but well worth it. We were on our last day of vacation. Got seated right away. But was put in the furthest corner of the outside seating areas. Right on the corner of where people enter/exit to the beach. It was very dark and not well attended. We got water right away but had to wait a while for a server to come by who didn’t even to offer drinks or ask about appetizers. I think when the hostess finally remembered that people were sitting there the server came over. He was knowledgeable but didn’t tell us too much about the prix fixed menu, didn’t offer cocktail menu. The food was prepared well and was flavorful. I couldn’t get a feel for the ambiance because we were so far away. We won’t be back to this restaurant. 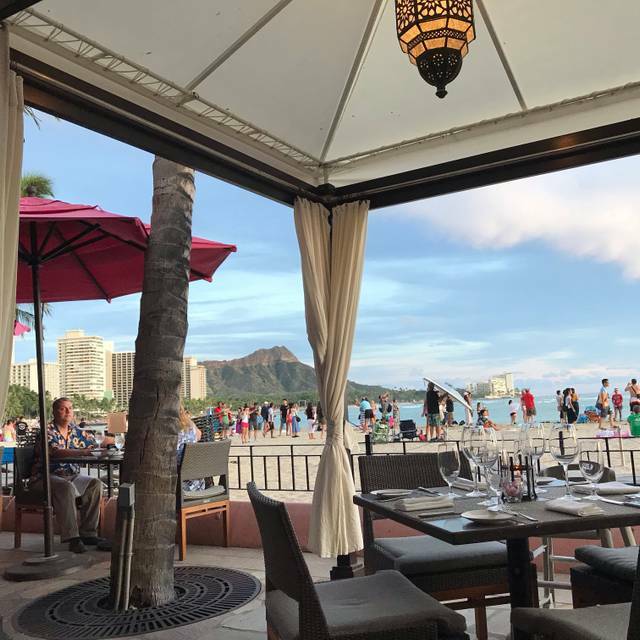 There was nothing outstanding about the meal that would make it worth returning, especially with all of the other choices around Waikiki. On holiday in Waikiki. 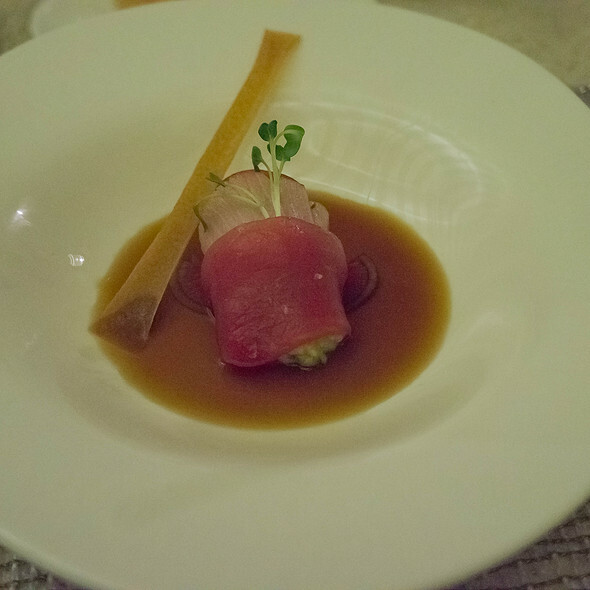 Azure is a bit more pricey, but almost everything is pricey in Waikiki, including mediocre restaurants. This place is worth the price. We shared a nice Big Island salad, plenty for sharing. Both had beef & reef, a filet & Kona lobster tail with horseradish mashed potato, creamed whole leaf spinach & baby asparagus. Everything delicious, cooked perfectly, nicely presented. Also house made breads with clam dip & butter with local red salt. Could barely finish, no room for dessert. Decent wine selection. Venue on beach in Royal Hawaiian hotel. More elegant than other beach side restaurants, but casual attire ok.
Low volume Motown music unobtrusive, but quite unnecessary. Can enter through hotel or from beach. The location and view was very nice. The staff and food were amazing. We were not disappointed in anyway. Great view and attentive waitstaff. Food was average and overpriced. They took the fresh fish options off the menu but not offf of the menu on their website which was a disappointment. Everyone and everything was exceptional. We will recommend this restaurant to all who plan on visiting the island in the future. Our server was spectacular. Six of us opted for the chefs tasting menu and wine pairing. Each course exceeded the last. The soup was not appealing, it was so bland. 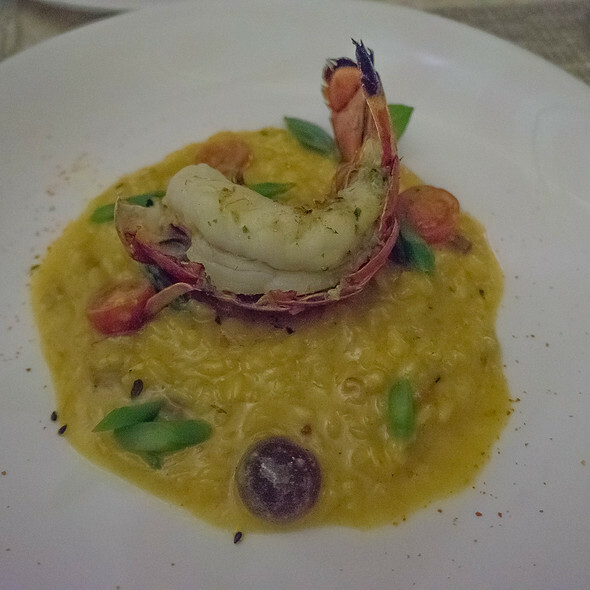 The small plates is a great idea, but the lobster dish was not worth the price. The view is self-explanatory - you either have a view of Diamond Head or the setting sun. To die for! The food was amazing and beautiful to look at as well. Highly recommend! Excellent spot dine. Right on the water and at booking requested outside table which was great. They were busy and were very apologetic that we could not be seated immediately even though we told them we were 15 minutes early. Food, wine and overall service was excellent. Bit slow to start with but the atmosphere / location meant you weren't worried about it. Highly recommended. 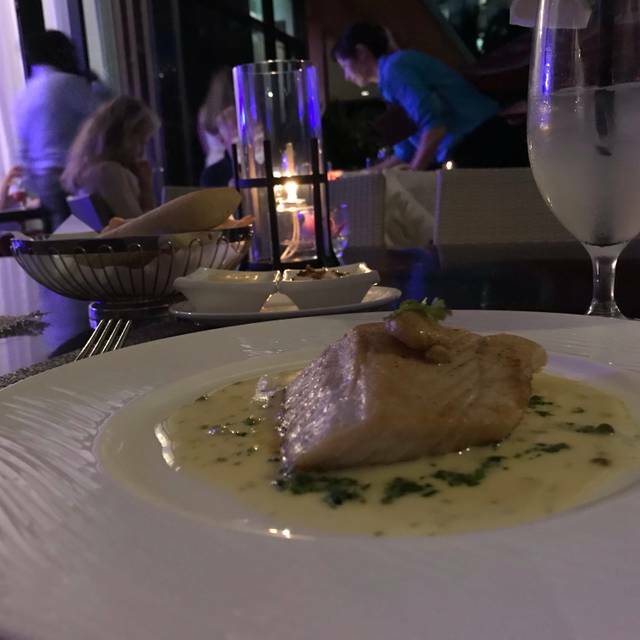 Every time we dine at Azure it is an amazing experience. It is our “go to” special occasion choice for dining. The food is outstanding! 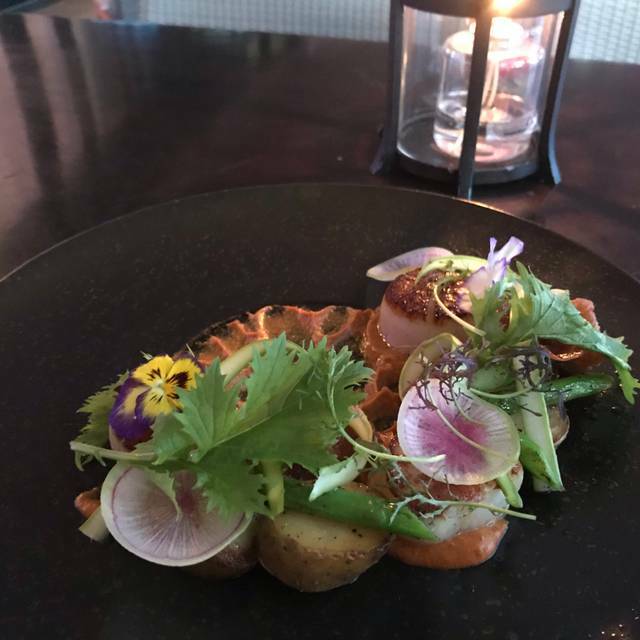 Always delicious, fresh, inventive and beautifully presented. Service is always impeccable. We loved Stanton. Not our waiter but a delight and he added so much to our luncheon! The cost is small for the wonderful time you will have. Add to that, is there any venue more beautiful than the Grand Old Dame of Waikiki? The Royal Hawaiian is a treasure! Overpriced. Poor check in process , reservation for 8:15 pm arrived 7:45, told to come back st 8:15, no beeper, text or even saying “ we will come get you in the bar”. ( The restaurant bar has about 10 seats! )Waiter was too passive, slow and not engaging.Pork chop entree was huge , tender , delicious $40! Gnocchi entree was small, not enough broth, gnocchi were good, but almost burned outer shell , never had it like that before. $42. Waiter took too long to ask us about dessert and then just disappeared, we gave up, would love to come back but it’s too pricey. I agree with a previous post about lounge chairs obstructing the view. We have eaten at fine restaurants all over the world. We decided this restaurant tops them all. The best steak we have ever had!!! We ordered the Beef & Reef. Also make sure you have the desserts. No detail spared. So amazing! Can’t wait to come back. Scott (Server) and Andrew (Maitre d’) were both fantastic, friendly and helpful. Scott knew the food and wines intimately and Andrew showed a similar passion, particularly when I was explaining the Chaine des Rotisseurs badge on the wall (I have been a member since 2004). Fantastic sashimi appetizer and simple grilled opakapaka. Perfect venue in the beach. One of my favorite dinners on Oahu. We eat out a lot and appreciate good food. Azure provided one of the best meals we’ve ever had, along with outstanding service from Scott. We had the gnocchi (which melted in your mouth and had so many different delicious flavours), the poached lobster tails (which were outstanding and perfectly cooked), the lemon cheesecake and passion fruit creme brûlée. Our cocktails were fantastic and the wine and port recommendations did not dissapoint. We would definitely return and will be recommending Azure to any friends or family who visit Waikiki. Thanks again! Our server was excellent, but two of the courses took a ridiculous amount of time to come. When it did, it was good, and the server was apologetic. The atmosphere is hard to beat. Chose the tasting menu because i couldnt decide what entree to have, as everything was appealing. The 5 course menu with the amazing wine pairings was a great choice. After disastrous dinners at Roy’s and Stripsteak . Everything was superb. The Azure is a very special place in every way. We were celebrating our Anniversary and my wife’s Birthday Day. We couldn’t have had a better experience. The food was sublime. We both started with drinks followed by salads as a starter then a delightful entree. We each had the Beef and Surf (lobster tail) plus the included sides. The Azure included a wonderful flourless chocolate cake desert. I’d recommend every item. Our server was great. Very attentive, but seemingly in the background and never intrusive in our special evening. The other staff we interacted with were also great, very friendly and polite. We will be back for sure. We were very disappointed with our experience here. My husband and I made a reservation for our anniversary dinner while on vacation. The whole night the service was VERY slow, despite the restaurant being not very busy (our res was at 8, and we didn’t leave until 10:15). The first thing we made clear was that I am pregnant and wanted to adjust the seafood tower so there wasn’t any raw fish, and also so I could order a virgin cocktail. When my cocktail arrived, I took a sip, and it had vodka in it. Our server exchanged it happily for a new one with no alcohol, but still a huge mistake on their part. We were very happy that they accommodated our request about the seafood tower, and everything on it was delicious. My husband wanted to order a full size of their scallop “small plate”. When his food arrived, they just gave him two plates of the same appetizer, and then charged him $60 for his “doubled small plate”, which we thought was kind of crazy, as it was not what we asked for (my actual entree was larger and was $50). Not to mention that it was awkward for him to be eating from two full-sized plates. We then ordered a creme brûlée for dessert. The server brought us out spoons for it and we sat and waited for about 10 minutes. He returned after 10-15 minutes to let us know that they were out of creme brûlée, which made us think he forgot to put the order in until then. By that time it was past 10pm, and I was exhausted and did not want another dessert. I felt as though he should have comped us for something with all of the mistakes that were made, especially giving a pregnant woman a drink with vodka after she explicitly made the situation clear..Disappointing because the food was very good, and the seafood was incredibly fresh-tasting. 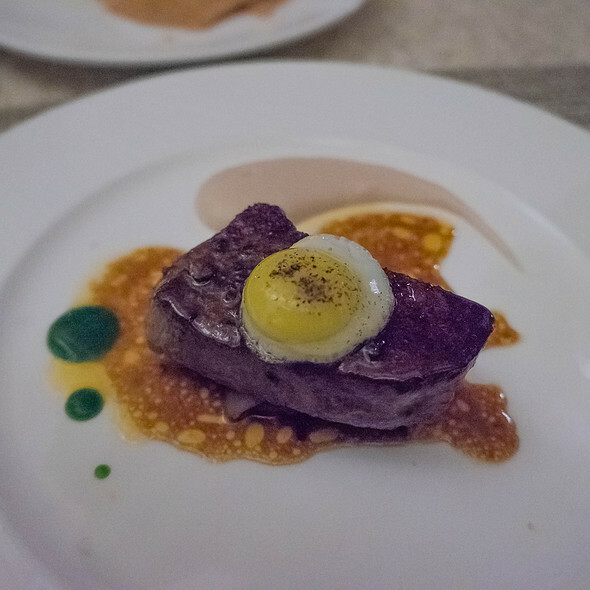 Azure is your fine dining option at the Royal Hawaiian Hotel. The interior is very nice, but having the outside patio right next to the Mai Tai bar is off putting because you get all the drunk people and loud conversation from Mai Tai's while you eat your expensive dinner. The view, of course, is great. But there is a major disconnect with the outside not in keeping with fine dining. Our server was very frazzled and unaware. He unfortunately did not act like a competent waiter. Rather, a server possibly at a Denny's or IHop. We had to ask the busboy to have him even acknowledge us. He was really out of it for the entire night, never really checking on us and for the price, the service was really lacking. I would not recommend Azure. If you'd like fine dining, I would definitely find something else. Even though our food was good, the service really sank the ship. They just didn't seem to really care for their patrons. Azure was a sublime dining experience.